Smartphone technology has advanced significantly in the past few years. Smartphones are being used for more than just phone calls these days! And why not? Just about everyone carries a smartphone with them. Now you can use your Bluetooth enabled smartphone (Android or IOS) to control your LED lights. 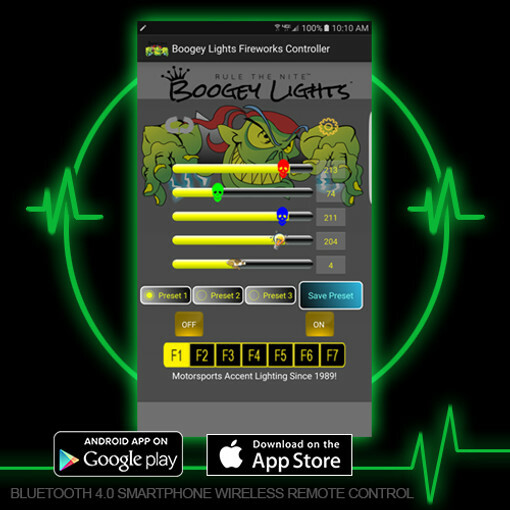 Just download the free smartphone Boogey Lights® APP and you're ready to go. We offer several different smartphone controller configurations for just about any motorsports application - motorcycle, atv, golf-cart, RV, motorhome or boat! If you're unsure as to which Bluetooth controller to purchase, give us a call and one of our LED lighting experts will be happy to assist.